Most Pilatus designations are relatively straightforward. Originally, numbered designs were simply prefixed 'P' for Pilatus. The PC-6 designation sprang from its design name, 'Pilatus Commercial Nr. 6'. Since then, all internal Pilatus aircraft designs have received the 'PC' prefix. The Pilatus designation style varies. Variations seen on 'P' and 'PC' designation display include hyphens, periods, spaces (and, sometimes no spaces), between letters and numerals. Pilatus, itself, now uses hyphens so I have stuck to that style. Variations like 'PC-XII' are strictly marketing efforts. Pilatus designation anomolies are the 1944 SB prefixes (anyone have any ideas about the meaning of this acronym? ); glider designs built by Pilatus which retain their original designations; and, the long-form B4-PC11 designations applied to the licenced PC-11 gliders. One further anomoly occurs due to a joint study project - the PD-01 - between Pilatus and Poligrat Development GmbH of Munich. According to Flight International (25 April 1974), the "new Master Porter PD-01 light cargo/passenger transport in the Skyvan class [...was ...] being constructed under a contract agreement with Pilatus." However, it seems highly unlikely that any actual construction work on a PD-01 prototype ever began. - P-3-04: [??] Poss desig. held for 320 hp Lycoming/Continental vers. -- PC-6/B2 (STC): 2001 1 x 750 shp PT6A-34, x 32 new/convers. - PC-XM: [Project] motoglider, 1 x 65 hp Limbach-VW HO-4 conv. Impeccable work, Apophenia, as usual. Thanks for this! As for SB-, it's not uncommon for certain companies to use the initials of the designer as prefixes, so it would be interesting to know who was in charge of the Pilatus design bureau at the time of the SB-2 and SB-5. "Experimental Motorglider" for PC-XM sounds highly plausible. And, if there was an SB-2 and a SB-5, can we reasonably assume that an SB-1, SB-3, and SB-4 reached at least back-of-the-envelope stages of design? Probably a typo ... but where were the proofreader's eyes? BTW: I see the odd reference to Pilatus 'P for project' designations but didn't include any of them in my P/PC designation list. the PC-10 accommodated 16-passenger and had 4700 kg weight. Hesham: There were a series of different PC-10 concepts. The first was a turboprop PC-8D derivative - so a 10-seater. The second was the MiniTwin - an 11-seater. 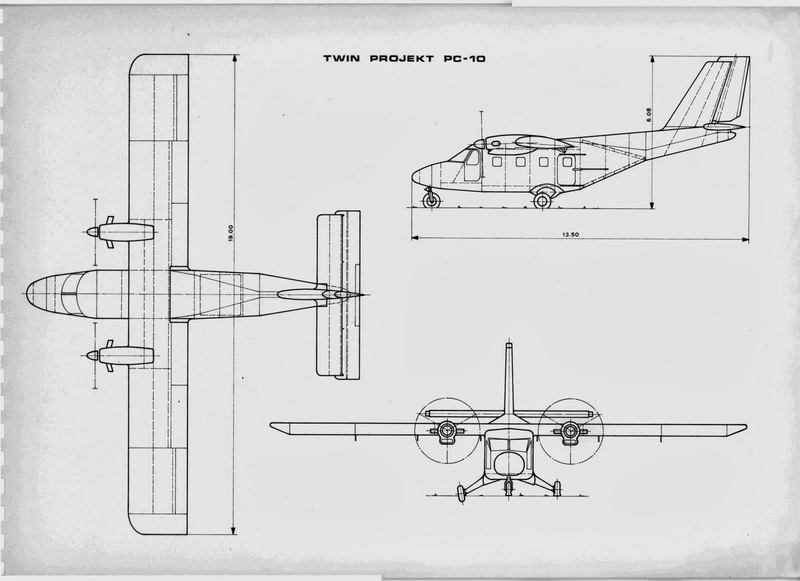 The third was the design you refer to - the 16-seat Twin Projekt PC-10B. Alas, that doesn't get us any closing to knowing what the 'SB' stood for. is that mean a high altitude aircraft ?. ^^ More like: suitable for operating in the mountains, I think. A Swiss interpretation of bush plane. Any informations about the S.B.1?